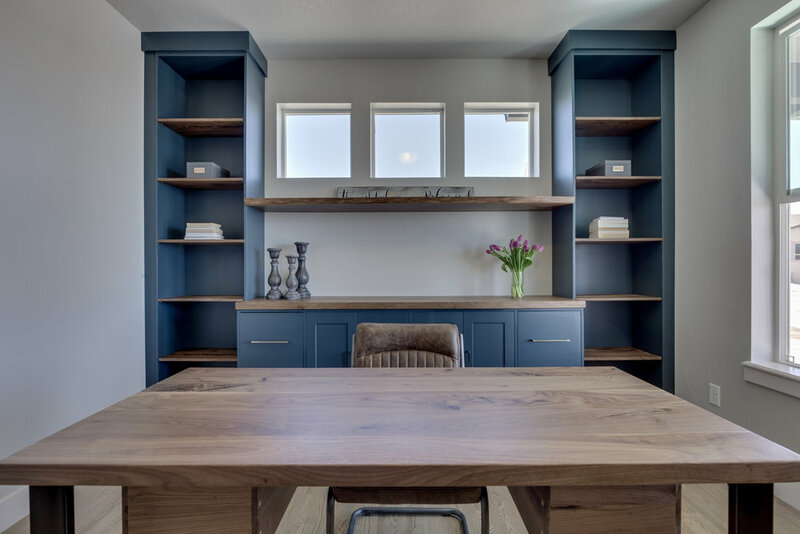 Clean lines and a cool color palette gave this custom Saddletree home in Cordera a fresh and contemporary living room, kitchen and home office. 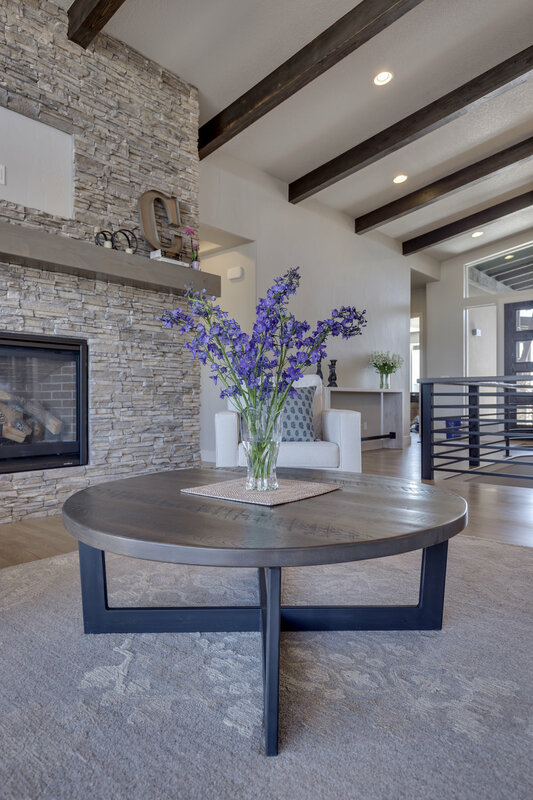 Keeping the furnishings comfortable but minimal was important to the homeowners, so as not to distract from the sweeping views of local park trails and beautiful Pikes Peak, the most captivating feature in Colorado Springs! For the great room, we designed a simple coffee table and sofa table to complement one another, complete with American steel accents. 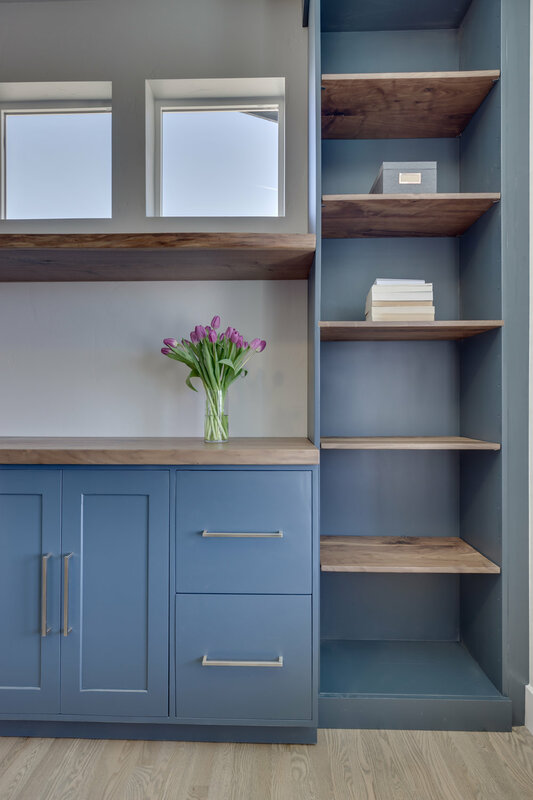 A home office with ample of storage was essential so we created custom casework, finishing the look with a live-edge slab shelf and a pop of color to add interest to the work space. The desk is our Braylon Square in natural walnut with drawers for added storage. We utilized our cantilevered Ansel Dining Chair as seating for the desk. This family loves to host, so an over-sized dining table was a neccessity. We went with our Jameson pedestal, large enough to seat eight with a round shape to encourage conversation. And finally, a large blank wall beckoned for a custom waterfall entry table to greet incoming guests.